What about raiding Xu Bing (徐冰)’s A Book from the Sky (天书)? It’s made (I believe) of imaginary characters made to look like real ones (using real radicals, etc). With all respect to Xu Bing, the hard part is not in combining existing components in a novel way; the hard part is making the “fake” characters look legit when placed side by side with other characters represented in a standard font. Great post as always, John. To me there’s another interesting level to the “don’t recognize a word” issue, which is that Sometimes, in Some cases, the nature of Chinese characters makes 80% word recognition easier in Chinese than English. Skipping past all of the usual discussion of whether the writing system is efficient (it’s not), the one small advantage characters have over English is that sometimes — maybe even often — they convey what the character means. Anyone who’s looked at a normal Chinese menu has probably come across weird food characters they couldn’t pronounce correctly but could guess the meaning of. Even with less context than a menu, correct obscure-Chinese-word classification happens pretty regularly. Old weapon characters come to mind as another pretty identifiable category. This is something that obscure English words don’t often give you: some clue as to their meaning. Sure, I know, you can try to look for word roots and foreign borrowings, and that works sometimes, but most of the time those origins are obscured by spelling weirdness and morphology and so on. So the 80% recognition thing might not Quite be apples-to-apples between English and Chinese. Again, not to argue that Chinese isn’t damn hard, but that in this one limited area, it may have a slight advantage over English. Absolutely excellent. Thank you for taking the time to make an example that will speak to Chinese audiences so effectively. I am soon part of a webinar with (almost all) native Chinese speakers about comprehensible input in Chinese teaching. May I share the link to this article as a way for them to feel the impact of different levels of comprehensibility? Of course! Please feel free to share links to any of my articles anytime. Really cool! It accomplishes the 80% comprehensibility goal pretty effectively, I think. At least in some cases, you also manage to obscure any good cues to pronunciation (and of course no one can guess the tones). That’s the part that really bothers me as a non-native reader. Thanks for this. Frustratingly, I can’t get the 95% and 80% samples to load at all from within China – even on a VPN. Any suggestions? Even if the image is blocked, you should be able to click through to the URL the image is licked to. Does that work? I enjoy your thoughtful, intelligent and — to me at least — original stuff. Two queries. You write about the characters problem differentiating English from Chinese. This seems arbitrary to me: a very high percentage of native English-language readers agree that p-l-a-t-e spells “dish” unless they have some clue other than the letters on the page. Meself, I’m open to the possibility that all of us need clues other than the letters on the page, and it’s just that some of us are good at supplying our own of these. Somewhat similarly, you make the distinction “Guessing doesn’t count” when judging whether sophisticated native readers of Chinese are going after your obscure characters. Why not? What’s this distinction between guessing and knowing? I bring a bias of my own to questions like these. It seems to me there’s a Marco Polo Syndrome out there amongst experts of all kinds, starting with grade school teachers who think they know more than grade school students. This syndrome starts from the sure knowledge that one is superior because one has accomplished something astonishingly difficult, e.g. getting to Peiping in the 15th Century, and then back to Europe. This means you know something your audience doesn’t, and this, in turn, gives you license to tell them anything you damn well please. It is particularly important that one have this license in order to tell them things that force them to acknowledge one’s superiority. This certainly doesn’t mean that you should tell any untruths, you understand. In Marco Polo’s case, for instance, saying that people on the other side of the world have their faces on their chests and no heads is not an untruth, it’s just a shortcut. It would take so long to explain that they have sallow skins, epithelial folds and long fingernails, so chest-heads can serve as a sort of place-holder of truth. Language manuals are full of such place-holders. Folk etymologies and, worse, foreigners’ invented folk etymologies, are whole classes of these bogosities. “Wear this fourteen-pound tape recorder around your neck for three months, play it eight hours a day, and you’re going to Osaka,” was Voice of America’s Jack Masey’s advice to new recruits in 1967. If you didn’t, you were going to be on the street…. Mormon missionaries, State Department FSO-2’s, and CIA folks, follow these instructions. They do well. What they accomplish in three months of hard work seems trivial. They speak a very little bit of the target language with a relatively good accent. This is, in fact, a miracle, and more than many people with huge vocabularies and reams of publications achieve in a lifetime. They function. I went to Georgetown’s school of languages for Chinese, and I know a number of Mormon missionaries who did Chinese. None of these claims is accurate about the degree of fluency or proficiency these programs impart. Sorry. John has it right. 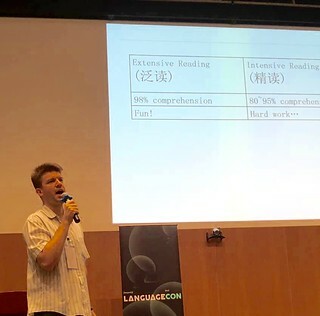 His point is not that Chinese is difficult per se, it’s simply that ANY language is acquired through comprehensible input, and that for independent reading, the level of comprehensibility has to be very high — higher than most teachers think. There’s nothing Marco Polo about that, except the fact that most teachers don’t get it.